As my friends know, I like January 6th! Every year they receive a mail with good wishes on this day. It’s Epiphany day – the 12th and last day of Christmas. For me it is also the day of changing perspective – a magic pivot. The holiday season is over and we can focus on the coming year. I wish you many Epiphanies in 2016! 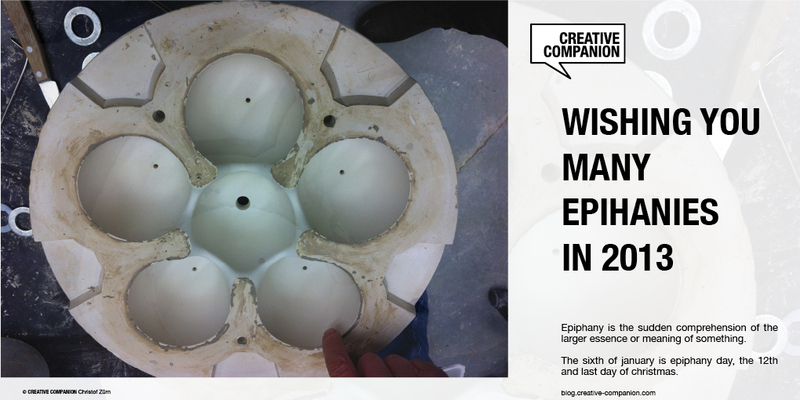 Epiphany also stands for an experience of sudden and striking realization. 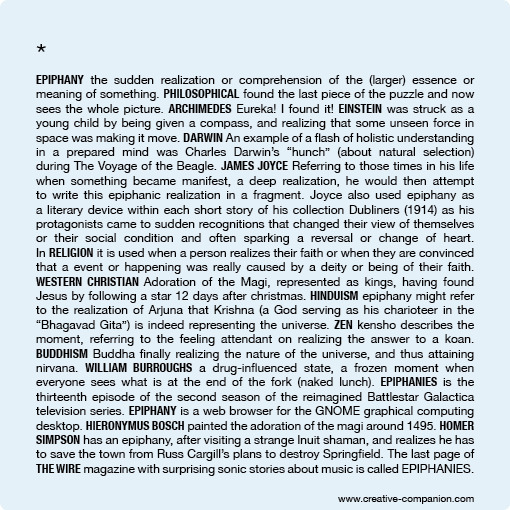 The word epiphany originally referred to insight through the divine (see the link with the three magi). Today, this concept is used much more often also without such connotations, but a popular implication remains that the epiphany is supernatural, as the discovery seems to come suddenly from the outside. More on this see below. When we were visiting the biennale in Venice last year we also went to the pavilion of Uruguay. When we entered the room, our first thought was that Uruguay did not manage to reach the deadline, because we could – at first sight – not see anything. Only white walls. Nothing there. We just wanted to turn around and stroll further. But, wait a minute, there are some people close to the walls looking into the deep white space. We went closer and then our eyes adjusted to the bright light and we started to see shapes, forms, shadows of tiny paper objects. The rich world of cut-out white paper on white surface. There were literally Many Shades of White. The artist is Marco Maggi. It also reminded me of the work of John Cage and his conceptual 4’33” piece about silence. Or better, the ability to focus, listen and look very carefully. A good exercise I want to keep in mind for the coming year. In the hope to get many epiphanies. www.creative-companion.com for Design Thinking, Service Design, User Experience Design and Online Strategy. 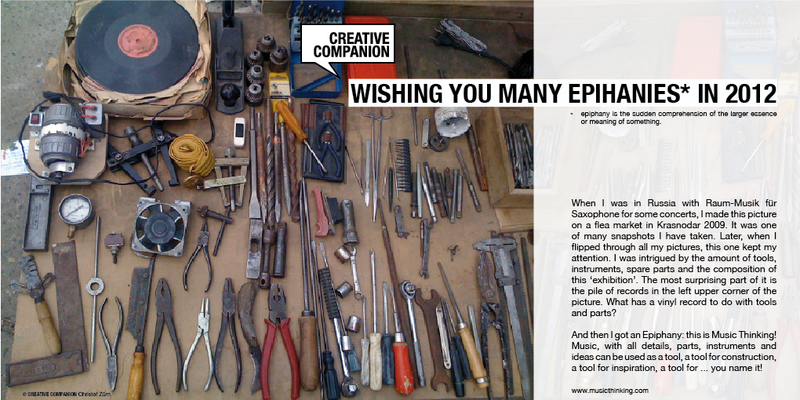 www.MusicThinking.com for inspiration, tools and discussions about how music can help us to be more creative. Last year I had the pleasure to work on a lot of very interesting projects with nice people. Today 6th of january is epiphany day – the 12th and last day of christmas. The holiday is over and we can focus on the coming year. 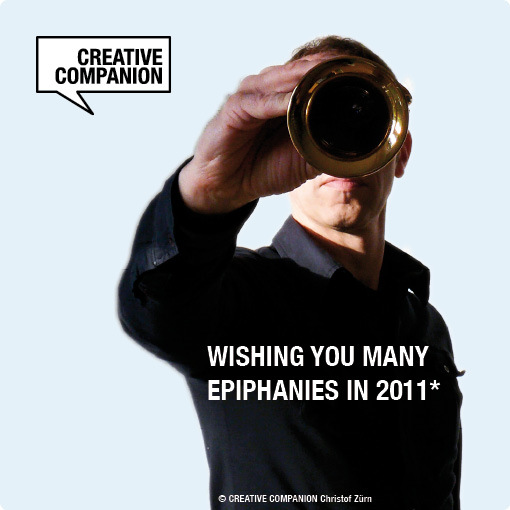 A good moment to say ‘thank you’ and wish you all the best for 2013 and hope that you will have many epiphanies!